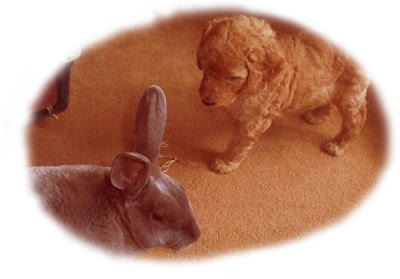 Captain Rupert bounced back from yet another holiday, with tales of new puppy dog friends. What fun and games he told me about as he shared his holiday snaps. Sorry for another brief interlude, K has been sailing again, (that's it for a while). We drove off to north Germany for a windy week on a lovely sandy beach. It was a long and tiring drive towing a boat. Great sailing for K and I got some painting done. I did not take any holiday photos, which was a shame, but you can only take so many pictures sitting on the beach at a sailing regatta. Its nice to be home and find lots of tasty veg in the garden, and some sunshine! Captain Rupert is of course enjoying being back in the garden. He has a new friend in the garden two, the resident Robin from the vegetable patch. 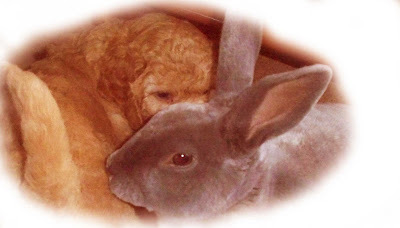 I'm sure they are hatching a scheme for Captain Rupert have a grand vegetable feast!! 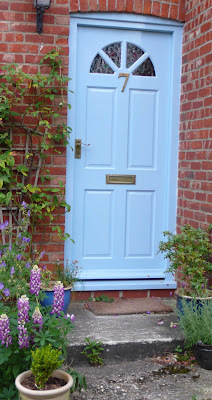 Ps... the lovely blue paint colour is light teal in dulux heritage range. 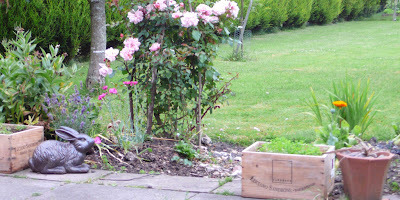 Not only has the blog been sadly deglected for the longest period ever, so has the garden. I need to get out and sort out all the weeds, cut the grass and hedges and generally make it look pretty again. The area around the front door still looks ok. I'm really pleased with the colour of the lupins and the front door. The problem with leaving the blog for so long, is feeling all of a muddle of what to say. Its much better to do shorter posts more often (mental note to ones self). Its not that there has not been lots going on, but then maybe that was the problem there has been lots going on. 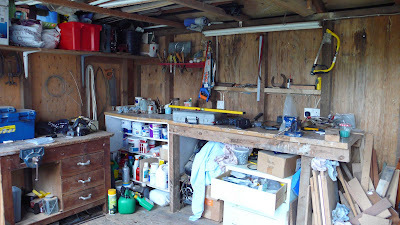 Just thought I would add a photo of the inside of K's shed its been a hive of activity with all the DIY. K also whipped up a great new card display for the garden show which I had a stall at the beginning of June. (sadly forgot the camera for photos). It was a wonderful show full of lovely things, in a great setting. 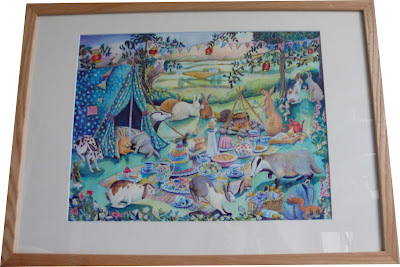 I felt really encourage by peoples lovely coments about my work - a big thank you. It filled me full of confidence. I have to admit I lack a little in the confidence department, I must over come it. Just before the show I spent ages agonising over how I could get full size prints (A3) done of captain Ruperts party picture. At the very last minute I invested in a new A3 printer, with ultrachrome inks with a 200 year life. I can now do lovely big prints. It was the only way really to do justice to Captain Ruperts Midsummers Eve party picture. I had the original and the print together and showed K he could not tell the differance so I'm delighted with the quality. I had the prints just in time to take to the show, which was fantastic. I'm saying a fond fare well to the little Westies. 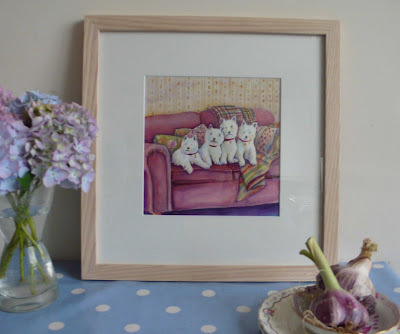 They are all framed and and can't wait to settle into their new home with some more Westie friends. I have also been doing a little sewing, I'm not best at sewing. When I was little, I would make dolls and glue their clothes as I had no patients for sewing. 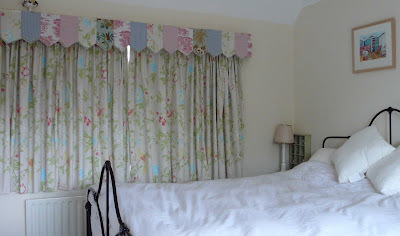 I'm finding it more enjoyable now and sewed pelmets by hand as my sewing machine is always misbehaves. They still need finishing, with ribbons and bells and sparkly bits, but they work at keeping the morning light out without all the fancy extras. I still need to make the one for the other bedroom window in total its going to be 40 panels! 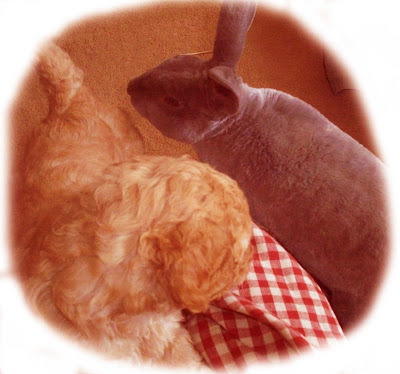 I have some nice felt too for sewing more captain ruperts. I have told you Captain Rupert has been for his summer holidays, we have been away too. K has been sailing down at Weymouth, and I love the time he is sailing to sit on his boat cover and concentrate on painting. So we packed the car jam packed full of sailing things camping things, paints and paper for a windy week by the seaside. I can't beleave I forgot my camera, but that made me use my sketch book which was a very good thing. I will save my paintings and drawings for another post. The days went so quickly and soon it was time to return, for a few days manual labour on our new driveway. We had always planned to have of street parking, we are not allowed to have it in the front garden and in the back garden we needed planning permission, so it took time. 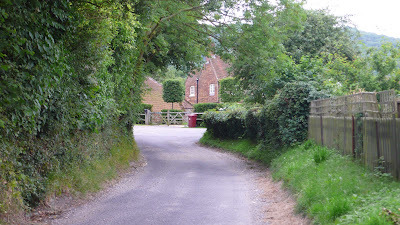 We finally sorted all that out which was great as although its a quiet country lane you get tractors and combines and grain lorries and the gritter in winter not somewhere you want to leave your car. A digger dug it out the other week leaving us to find some railway sleepers and build the little retaining wall and put up a new fence for Captain Rupert to disaproove. It took 3 days, of K and I hauling sleepers around and shifting earth, at least 2 tons. I was shattered. Other casualties involved a bent and blunt chainsaw a cracked socket set and some broken drill bits and screwdriver. We are pleased with the end result even though it has eaten into the garden a little. I can't wait to get some more plants in to soften the look abit too. Just need to sort out the scalpings and gravel. And see this view as we pull out of the drive. I am slowly going to be catching up on everyones lovely blogs. I worked out I can subscribe to the rss feed in yahoo mail and hopefully keep up to date much easier on all the blogs I read with out getting in a muddle and giving up on blog land. Do remind me if you would like a link in the side bar and are not there, I still need to update it. Its feeling good to be back in the world of blogs, thank you to everyone who is still here. Had better go and catch up in the garden while the sun is out. Just sorting through the photos of all we have been up too, its been soo very busy with one thing or another. I thought in such a long absence I would try taking some video of Captain Rupert. He has just returned from a wonderful holiday with Great Aunt Velvet and his illegitimate daughter, who rather confusingly has turned out to be his son, he is growing into a fine handsome rabbit indeed, much like his father. I will try and get some pictures next time we visit. It was a very much deserved holiday, first he was not well with an upset stomach. I think because he had been confined to concrete barracks while the fence was down. I felt sorry for him and gave him lots of extra dry rabbit food. He got better quickly thanks to a visit to the vets. Then the next week Captain Rupert woke me up at 3 in the morning. Making such a commotion, thumping his feet. I looked out of the window and there was a rather handsome but wily Mr fox. Poor captain Rupert was so worried. Not surprising really I said to K it would be like us having a huge T REX windows. I brought Captain Rupert into the kitchen for half an hour until he felt a little better and then tucked him up. The next night I could not sleep a wink for worry that Mr Fox would return, I tossed and turned and then had to check out of the window to see if Mr Fox would return. I am hoping Captain Ruperts holiday will throw Mr Fox of the scent. I have no idea if this video will work, fingers crossed, the file seems rather big and is taking a long time to load. Captain Rupert is checking out the new fence around our new driveway. Its made his garden a little smaller and his not too sure if he approves. Back to a full service soon!! !